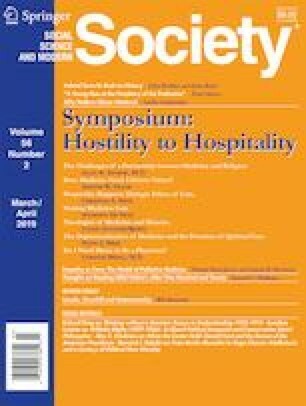 This essay responds to Balboni and Balboni’s 2019 book, Hostility to Hospitality: Spirituality and Professional Socialization within Medicine. In contrast to Balboni and Balboni’s argument that spirituality and medicine are oppositional tensions, I argue that medical care is itself an inherent manifestation of spirituality. The concept of “person-centered medicine” represents enhanced interpersonal relationships between patients and practitioners and leads to an appreciation of the personhood and inherent humanness of patients and their families. I explain ‘dialogic ethics of care,’ and claim that the hospital space is a community of dialogue, hospitality, and holiness; of love as a verb. Davis, C. S., Snider, M. J., King, L., Shukraft, A., Sonda, J. D., Hicks, L., & Irvin, L. 2018. A time to live and a time to die: Heterotopian spatialities and temporalities in a pediatric palliative care team. Health Communication., 1–11. https://doi.org/10.1080/10410236.2018.1443262.